The slime war has begun, explode them all ! / La guerre des glaire a commencé, explosez les tous !! Pretty cool game, though a bit difficult to understand at first. I eventually realized that clicking on the slimes reduced their size and teleported them and that fully destroying them would reward a point. I agree that adding a lose condition or a way to build a combo would make for more engaging gameplay. Could quite easily be made more fun and more playable. Currently it's just pointless (pun intended) clicking. 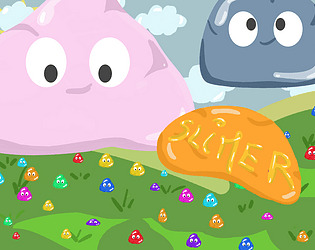 Something like adding a limit of how many slimes can be on the screen or the player will fail. Maybe add point multiplier when clicking the same colour slimes in a row.